Nigerians have a new currency in circulation. It was issued recently by the "National Assembly of Corruption and Terrorism". The new "legal tender" is worth F620,000. "F" stands for Faroukas. The note has on it the picture of a smiling Honourable Farouk Lawan, an influential figure in the country's lower House of Representatives, who has been embroiled in a murky corruption saga with businessman Femi Otedola, from whom he was alleged to have asked for and received a bribe of $620,000 so that Otedola's name and that of his oil company, Zenon, would be delisted from the list of those accused of collecting huge subsidy payments without delivering the petroleum product which the Lawan committee was investigating. This has been a closely-followed running story in Nigeria for some time now. And when Nigerians were expecting both Hon. Lawan and Mr. Otedola to be brought to court on corruption charges, news broke that the prominent legislator had been cleared by the ethics committee of the House of Representatives - hence the issuance of the "620,000 Faroukas" note by humorous Nigerians who quickly renamed the hollowed legislative chamber in the federal capital city of Abuja the "National Assembly of Corruption and Terrorism". Address on the currency? Simply: "Corruption Headquarters". It is not for nothing that a global poll once ranked Nigerians as the happiest people on earth. They surely are enjoying their young and fragile democracy. Here is a country whose legendary Afro-beat musician, the late Fela Kuti, once described its people in one of his iconic songs, as "Suffering and Smiling". Trust Nigerians, democracy has brought out the best of their wits, that when things are hard and hardly anything goes right for them and they should naturally be suffering, they generally make light of it all, suffering and smiling and just getting on with life. That's partly what makes this country of 160 million amazing. It is the biggest black nation on earth. Every one in four Africans is a Nigerian. And every two in seven black people in the world are Nigerian. Apart from the fact that there is an inherent democracy in the temperament of the nation, with robust arguments and debates on how to move the nation forward - every Nigerian is a potential president with solutions to the country's myriad problems - the dynamism, enterprise and resilience of Nigerians is remarkable. It is, therefore, not surprising that a lot of hope is placed in this country by the international community. It has often been said, for instance, that if democracy is to work in Africa, Nigeria must provide the acid test, and be the engine room to drive the political and economic renaissance of the continent. Having gone through its bitter years (over three decades) under military rule, the country is now, for the first time in its history, enjoying its 13th year of uninterrupted democratic rule. On a very serious note, for a country where until recently the only certain thing about it had been uncertainty itself, this is no mean achievement; it is a remarkable feat. If Nigerians themselves are not clapping for sustaining this democracy for this long, it is not because they are not appreciative of it, but because they had often placed too much hope in their leadership to deliver the badly needed dividends of the democracy but were often let down. However, the world should be applauding because this young democracy needs all the encouragement it can get and which it surely deserves. Nigeria's democratic journey has by no means reached its destination yet. It is still under constant pressure, the pressure of leadership, to get the right person with the vision and know-how to lead this complex nation. Secondly, it is constantly under threat of severe division because of the diversity of its ethnic composition - 250 of them, sharing 800 languages. Each group wants its own man to be the one leading the nation. It is called sharing the "national cake". Thirdly, the leadership question and the ethnic pressure are compounded by the time-bomb of religion. Nigeria is divided almost evenly between the Muslim north and the predominantly Christian south with a sizeable number of animists thrown in for good measure. For some time now an insurgency group from the north, calling itself Boko Haram (meaning Western education is a sin), has been bombing churches indiscriminately across the north killing so far over 3,000 people. It is the closest the country has come to war since the Biafra Civil War of 1967 to 1970. However, perhaps the biggest problem that could tear the country's fragile democracy apart and make it impossible for the country to realise its ambition of becoming one of the world's top 20 economies by the year 2020, if care is not taken, is the issue of corruption. Corruption is so endemic in the country that there is hardly anything one does without parting with or exchanging some money either as "dash," or in big bribery payments. A recent World Bank survey revealed that 80 per cent of businesses in Nigeria in 2011 had to pay bribes to government officials to stay in business. Widespread corruption in past administrations has led to the collapse of such hitherto successfully run national commercial services and institutions as Nigeria Airways, Nigerian Railways, Nigerian National Shipping Lines, NITEL, the postal service NIPOST, to mention a few; and it is even more ravaging now than ever before, under the watch of President Goodluck Jonathan. The situation is so bad that no sector or institution is spared the scourge of corruption, not even the Church where the president of the Christian Association on Nigeria (CAN) was recently presented with a private jet as a gift to celebrate his 40 years in the pulpit! Controversy rages on in the country over the propriety of this controversial gift and the latest clergy to condemn it is the respected Catholic Bishop of Sokoto, Mathew Kukah, who describes the acquisition of private jets by Christian leaders in the country as not only embarrassing but also counterproductive in the fight against corruption. He adds that the trend negates the church's moral voice in setting an agenda for righteous living in society. Hear him: "The stories of corrupt men and women being given recognition by their churches or mosques as gallant sons and daughters, and the embarrassing stories of pastors displaying conspicuous wealth as we hear from the purchases of private jets and so on, clearly diminish our moral voice." Latest figures show Nigeria to be in the top league of countries that have ordered most private jets in recent years, with the source of the funding always questionable. 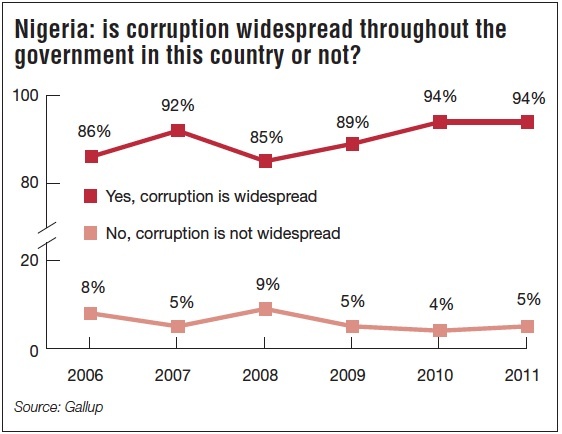 The latest Gallup Poll globally indexing corruption places Nigeria as the second most corrupt nation in the world. That was the position it occupied before democracy in 1999. When President Olusegun Obasanjo came to power as an elected president in 1999, he identified corruption as his biggest challenge and made combating it a major national objective. He immediately on taking power embarked on a massive anticorruption crusade, setting up two special agencies, the ICPC (Independent Corrupt Practices Commission) and EFCC (Economic and Financial Crimes Commission) to fight and eliminate corruption from Nigeria's national life. The two agencies embarked on their task in an aggressive and business-like manner that was unprecedented in the country. President Obasanjo's effort yielded surprisingly good results, with some big shots like a former Inspector-General of Police, Tafa Balogun, arrested, charged and sentenced for stealing billions of Naira from police funds. Even some elected state governors were hounded out of power. Obasanjo's method in dealing with the phenomenon might be controversial but his objective then was to both shame and punish people for their corrupt practices as to serve as a deterrent to others. The initiative worked to some extent, and Nigeria, for the first time, moved dramatically from the lowly No. 2 spot it had occupied for many years in the Transparency International's annual global index. It moved up to about No. 15. 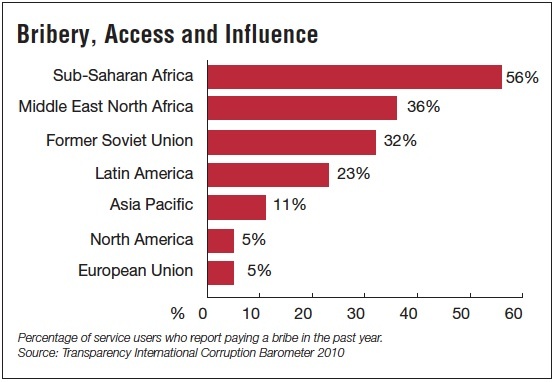 In 2011, the same Transparency International ranked Nigeria 143 out of 182 countries it surveyed for the year. However, today, under the Jonathan administration that has a former Managing Director of the World Bank, Mrs Ngozi Okonjo-Iweala, as its Finance Minister (some would say de facto Prime Minister), Nigeria has gone back to the bad old days. Okonjo-Iweala might be the darling of the West because of her impressive record while serving at the World Bank - she missed being the WB president by a whisker - but in the fight against corruption in Nigeria, the issue is proving beyond her. If she has the will, she has not got the power and support to make a difference. She seems confounded by the interplay of forces within the system that she seems to have decided to strike a delicate balance between sticking her neck out as an anti-corruption crusader and not getting anywhere with it in the end, and making the government more prudent and responsible with its spending. She's gone for the latter. As a result, she has been rather more effective in imposing her imprimatur on the finances of government, making it more fiscally responsible. Her attempt to clean up the subsidy mess has been met with rebuff as she is constantly accused of withholding oil marketers payments even when her ministry is only trying to verify such claims. In the event, fighting corruption is a daunting task for her. It is not surprising, therefore, there is corruption everywhere - in the Church, police, judiciary, national and state parliaments, in the local authorities; even to play for the country's national football team, the Super Eagles, one can bribe a coach to get a shirt. It is that bad. The Jonathan administration might draw a lesson or two from the Obasanjo experience. The former president, in some of his recent remarks on corruption, has been giving advice to President Jonathan on how to tackle the scourge. Drawing from his own experience while in office, Obasanjo believes, first of all, that government has to have the political will; secondly it must show persistence; and thirdly, there must be consistency, to be able to combat corruption effectively in Nigeria "because the people that are involved in corruption are strongly entrenched and unless you are ready to confront them at the point of even giving your life for it, then you will give in and when you give in, that is the end of it." In what looks like a slight criticism of the Jonathan administration's approach in tackling corruption, Obasanjo believes the government is laying too much emphasis on the corruption within the oil and gas sector: "We didn't see beyond the oil. That was one of the misfortunes of Nigeria or regrets of Nigeria; but more importantly, corruption came in. Corruption came in initially with politics at independence when our politicians gave a contract to you, they demanded 10 per cent, they thought that was the way to make money for their party. Ten per cent of that contract is taken to develop the party - the party fund and all that - and then, of course, it went beyond 10 per cent to 20, to 25 and at times, it grew so large that, in fact, when you are given a job, you just don't care to do it, you will share the money or whatever they called it. That was very bad...So, when I became president of Nigeria, the first thing I did after my election was to establish an independent body to fight corruption. Now, that body was so effective - in fact two bodies, one was a commission against financial crimes - and they were both so effective that ministers of government, the head of the police and the heads of parastatals were put in jail. If you are going to fight corruption, it is not a one night or one day war; you have to be consistent and persistent with it," said the former president. President Jonathan admitted the seriousness of the corruption challenge he faces in a nationally televised media chat November 18 this year, but assured the nation he was doing everything within his power to battle and defeat this phenomenon. He identified three specific areas where corruption is pervasive. First is electoral corruption, which he himself described as "the mother of all corruption". Second is corruption in the distribution of fertilisers. And third, the massive corruption in the oil and gas sector. His voice: "We decided to sanitise the electoral system, dealing with corruption associated with the electoral process. In most cases, people manipulate themselves into office; state governors, local government chairmen and others manipulate themselves into offices without being voted for, thereby posing problems for the country. We are aware that dealing with corruption associated with the electoral process will ensure that corruption is dealt with totally," he said. He went further to give his government thumbs-up in its effort to fight the cankerworm when he asserted: "We have done very well on various fronts in terms of fighting corruption. We have sanitised the fertiliser subsidy process; we have tried in sanitising the electoral process; we have now started the audit of the oil sector, pointing to the fact that we are in the process of sanitising the sector. If you ask the average Nigerian, they will say it is all because of corruption, that is why there is a pot hole somewhere and that accidents are caused by corruption. We just believe that everything is caused by corruption...But in terms of perfection, we believe that corruption is the cause of all our problems. Corruption is there and we will continue to fight corruption, no doubt about that. But this government has tried to investigate the corruption associated with the elections, we have sanitised it; the corruption associated with procurement of fertiliser is enormous, we have sanitised it; and we are now dealing with petroleum products, we will go ahead and sanitise it. We will surely sanitise this country." Will he? Well, Nigerians themselves are not convinced. They are not convinced because despite all the noise made by government about fighting all forms of corruption they rarely see individuals being handed long jail sentences or publicly disgraced for being involved in corruption. Examples abound: still fresh in their memories are some sensational bribery scandals such as those relating to Halliburton, Siemens, Wilbros, Panalpina and A.G Daimler. Nothing has been done to those Nigerian bribe takers, whereas the United States, France, Italy, Switzerland and Germany have not just indicted individuals and companies from their own countries who paid the bribes to Nigerians to secure contracts, those people have been punished, some of them now serving prison terms. The Nigerian bribe takers are walking scot-free and still peddling influence within the corridors of power. Besides, many corruption cases have been in the courts for years either without prosecution or they are mostly dragging on endlessly. Expressing his frustration that most cases that are in court have either not been tried or unnecessarily delayed on trial, the chairman of the Economic and Financial Crimes Commission (EFCC), Mr. Ibrahim Larmorde, explained why his agency has been unable to secure conviction of treasury looters. At a Senate Committee on Drugs, Narcotics and Financial Crimes hearing in Abuja, he laid the blame squarely on the judiciary for hindering the EFCC from prosecuting the big thieves. His revelation is startling. Hear him: "The truth is no case had been concluded…They will file this, the judge will overrule them, they will go to the Court of Appeal and lose there, but they will still go to the Supreme Court. At the Supreme Court when they lost, they will be asked to go to the trial judge for the case to continue. They will come with another application and certainly, for lawyers among us, we know how long it takes for a trial to go to Court of Appeal and get listed, then go to the Supreme Court get it listed and decided upon. This is the fate of most of the cases we have in court. This year alone, we recorded over 200 convictions in various courts across the country, but they are mostly advance fee fraud, we have the yahoo [internet fraud], we have the commercial cases, we have the executives of financial institutions that are involved in currency trafficking. The cases that most people are interested in their conclusion are those before the Supreme Court. Unfortunately, these are people who have the resources to drag these cases indefinitely and perpetually. That is why we have established a very strong Assets Forfeiture Unit. The first thing we do now is that we try to recover and confiscate the assets of individuals that we are investigating because it is only when you deprive them of their resources that you will be able to force them to stand trial. Once they have access to their resources and assets, they will use it to continue to delay and drag some of these trials." However, another reason why it is so difficult to believe that the Jonathan administration is serious about fighting corruption is because Nigerians have seen the hanky-panky being displayed in the handling of recent investigations into corruption cases in the oil and gas sector. As a matter of fact, it is the belief of most Nigerians that their country is once again the second most corrupt country in the world because of the monumental corruption uncovered in this most important sector of the country's economy. A recent investigation by the Petroleum Revenue Special Task Force into dealings in the sector led by a former EFCC chair, Nuhu Ribadu, had discovered that billions of dollars in signature bonuses paid by multinational oil companies to the nation are missing. To the astonishment of Nigerians the Ribadu report had hardly been handed over to the president when some powerful forces, trying to prevent the president from acting on its findings, used some influential members of the investigation committee to discredit it. Aspersions cast on the report at its official presentation ceremony, was shown on live television to the amazement of the entire nation. A "home video" of it is now available on the internet. It was an extraordinary display of shame and contempt for the office of the president who was there seated. If there was any hope that the president will use the findings of the Ribadu report to fight corruption in the oil and gas sector, it evaporated there and then. However, anti-corruption crusaders around the country are still appealing to President Jonathan not to listen to those who want to sabotage the report, imploring him to take action against individuals and companies indicted by it and not allow it to gather dust on the shelve like similar reports in the past which never saw the light of day once submitted. Corruption still remains an emotional issue in Nigeria. The country, according to a United Nations statistic, has lost over $400 billion to corruption since independence 52 years ago. Some Nigerians have called for the death penalty for culprits. Time will tell if President Jonathan can succeed where his other predecessors had failed. However, on the evidence on the ground, as they say, he has no chance in hell if we use the handling of the Lawan's and Otedola's alleged bribery saga as a test case of the government's seriousness to fight and eliminate corruption from Nigeria's national life. Placing the "Faroukas" in circulation, therefore, is Nigerians' own way of expressing their frustration while at the same time making light of a very serious situation in their national life - a la suffering and smiling. They don't trust the government to fight corruption; if anything, they are convinced that the government only pays lip service to the fight against corruption, which is sad because every Naira stolen from the treasury is one Naira less to reward honest enterprise and hard work; a situation which undermines government's own ability to improve the lives of ordinary Nigerians - putting money into education, health, infrastructure development and delivering generally the much sought for dividends of democracy. Kayode Soyinka is Founder/Publisher of the pan- African news and current affairs magazine, Africa Today.